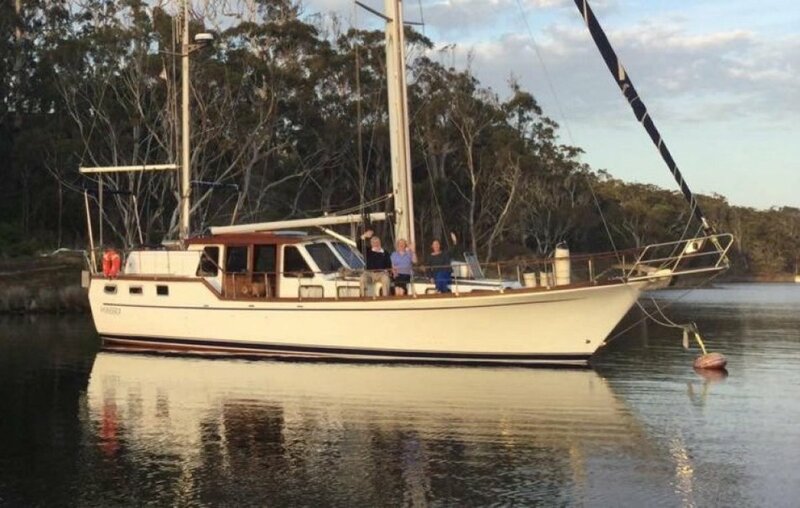 Muneera is a Nauticat 44 Pilothouse Cruising Ketch built by Siltala Yachts of Finland. She has a Lloyd's Register of Shipping GRP Moulding Note surveyors certificate, number 500060. She is Australian registerd ship number 859509. My wife and I purchased Muneera in 2010. She underwent an extensive refit in 2011/2012. We then cruised her extensively through Madagascar, East and South West Africa, Brazil, Central America, the Caribbean, and the Pacific. She is a proven blue water cruiser and would also make an ideal live aboard with her large volume and ample storage space. Racor 900 turbine fuel filters X2. Fuel tank polishing/transfer system via tank sump outlet through 1 X Racor 900 into top of other tank. Sight glasses on both tanks. With the bow sprit and davits she is 50'6 feet long. I may be able to help with delivery practically anywhere. Teak over GRP. Glued not screwed. Impervious. Teak replaced 2006. Yanmar 4JH3DTE 125hp with ZF25 gearbox. Both new 2012. 6 litres per hour at 7 knots approx. Shaft. External thrust bearing and "Aquadrive" coupling CVA 20300, new 2012. RIB, bimmini, aft hatch, life raft, large boat cover that extends from main mast to mizzen and ties to the side rails with water catcher. Large aft cabin with double bed and plenty of head room, on suite toilet and separate shower. Master with on suite and seperate shower, Pilot House, Galley/lounge, Bunk Room, V Berth. Kenwood KMR-700U stereo and amp in pilot house. Samsung flat screen in aft cabin. 3 X Dometic Marine Air, water cooled. Aft cabin, galley, bunk room. Plastimo Stainless Steel Gimbled oven and burners, Samsung TDS Microwave oven, ample storage and condements shelf. 140 Litres per hour. 240 Volts. Lofrans anchor winch with Muir deck foot switches. Lewmar Delta 40kg Anchor with 70M 10mm chain. Large Danfoss anchor with 60M 8mm chain and lots of rode. 3 X Electric with float switches, 2 X manual. 1 X bilge alarm. Viking 8 man 8 UKL/ISO RescYou. Off Shore. Purchased new 11/2012. Requires service. Usual flare pack plus rocket. 4 X 1.5kg 1 X 9kg all brand new. 12 Volt - 90 Amp Aternator on main engine dedicated to N70Z start battery. 150 Amp "P Type" alternator on main engine runs through a Balmar MC-614 multi stage regulator, delivering a true 150 Amps continuously if required, to the house bank. The house bank consists of 10 X Trojan T-105 deep cycle 6V batteries in series parallel, a total of 1025 12V Amp hours. The house bank supplies the 12 V distribution through a shunt/battery monitor, and supplies 12V to the Victron MultiPlus 3000,3Kw pure sine wave inverter/charger for 240V AC distribution to the 7 double power points on board. The generator has a dedicated start battery. All three banks can be emergency paralled in any configuration. Hood in mast electric furing main sail. Lofrans anchor winch. Side power bow thruster. The Victron 3000 MultiPlus inverter is also a 120 Amp DC charger, powered by shore or the generator. She has a 6kg LG Direct Drive washing machine accesible through a cover in the wall of the shower. Icom IC-M802 HF/SSB 150 watt continuous output - unlocked. Pactor 3 Bluetooth modem for email and weather grib files practically anywhere. Icom AT-140 Automatic Antenna Tuner. Standard Horizon GX2150 VHF, Autopilot Navman 3100. Depth Navman. (Note - Navman wind information not working) Plotter Garmin 4212 with AIS overlay and extensive charts. Furuno Radar. Vion electronic Barometer with graph. AIS receive only. Furling genoa, inner forestay flat jib, storm headsail, furling (electric) main, mizen (tired-needs replacing), light spinnaker. Ketch. Main mast hood with electric inmast firling. Mizen, lazy jacks. Wire rigging various sizing.